The 2013, 4th Annual Smoky Mountain Relic Show & Sale takes place this weekend, August 24-25 in Pigeon Forge at the Smoky Mountain Convention Center. When you hear the cannons, don’t worry: they’re real but no one’s under attack. For all its color and high drama, this is a family-friendly occasion. The core of the show features over a hundred tables of authentic Civil War relics, from southern belle ballgowns to photographs, artifacts, collectibles and weapons of all kinds, both on display and to purchase. 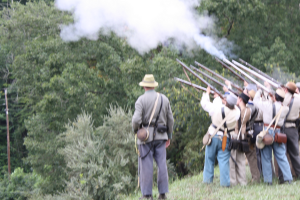 Collectors and experts from across the country join us as the Civil War era comes alive this weekend with the smell of gunpowder, the roughness of uniform cloth, and the compelling sound of music from the time. Historians, authors, soldiers and genealogists will be on hand to bring home the ordinary realities of this still recent and most dramatic part of our history. Also playing this weekend are The Un-Reconstructed String Band – old campaigners on the battlefields – as well as Boogertown Gap. Not only filled with music, the event also features dramatic reconstructions of society and battle, addresses by historical figures in period costume, artillery demonstrations and charges, and a fair amount of excitement and fun. Smoky Mountain Convention Center is at 4010 Parkway in Pigeon Forge. Times are 9 am – 5 pm Saturday and 9 am – 1 pm Sunday. Tickets at the door are good for both days, $8 grown-ups and $4 age 12 and under. For more information call 1-800-223-6707 and see the Smoky Mountain Relic Show & Sale web site.